Those were the days in Boulder … or were they? Al Bartlett, left, CU professor emeritus in nuclear physics, talks with member of audience attending Boulder Sesquicentennial panel discussion looking back at city's past 50 years. It’s so easy to say “Those were the days.” The older you get, the more you hear that comment. Fact is, you can’t turn back time. I’ve been a Boulder resident now for 36 years, but can’t claim the rare Boulder “native” status of both Harold “Sonny” Flowers, Jr., who has practiced law here for some 30 years, and developer Bill Reynolds, who founded the W.W. Reynolds Companies in 1966. They were joined by Al Bartlett, professor emeritus in nuclear physics at CU, where he started teaching in 1950; Doris Hass, a community activist who’s lived here for 52 of the past 58 years; and Dorothy Rupert, a state legislator from 1987 to 2001 who’s been in Boulder since 1962. CU’s Patty Limerick, chair of the Center for the American West, moderated. Their memories of Boulder went back to how much easier it was to settle in a small town, buy a house, perhaps on a professor’s salary, yet still be caught up in the emotions of a city entering years of long debate about growth and the environment. At least that hasn’t changed much. Hass remembered how the Carnegie was the best library in town, 28th Street was a dirt road and everyone shopped at Joyce’s Supermarket (now the home of LiquorMart.) She and her husband briefly left Boulder until a friend called to tell them there was one lot left on Bluebell and 22nd … for $10,000. That’s where they returned to build their home. When Bill Reynolds looks back, a Boulder High and CU graduate, he sees the past 50 years in a different light. Did you know that one of Reynolds’ earliest business ventures was running Tulagi on the Hill? “We sold a lot of beer,” he told me later that evening. As Boulder seeks to grow its business base but has fewer affordable option for housing, it has little choice but to continue to face “contentious land issues,” Reynolds said. He said the city must continue to help the University of Colorado – where Reynolds was a founding member of its Real Estate Center -- grow and prosper. So what do you say to those who believe this is the People’s Republic of Boulder? Rupert was working on her master’s at CU in the ‘60s when students were rioting and protesting the Vietnam War. She remembers the activism, but also things like shopping at the Green Mountain Granary, buying herbs from Hanna Kroeger and when Boulder elected its first and only African-American mayor, Penfield Tate. Before the students and police tangled in the streets, she pointed out, the Hill’s Colorado Bookstore had huge plate glass windows. Is Boulder the most liberal city in Colorado? Flowers took issue with that. “I find Boulder to be very conservative, and I have since I was a child.” When people have the wealth to live in homes of 8,000 square feet, he said, they have more influence on state and local politics than many realize. So what do you think has been the biggest change in Boulder in the past 50 years? Tell me your memories here. It’s OK to look back to the good ‘ole days. Boulder's July 4th Pow Wow parade in early 1930s marched down Pearl Street for the holiday. Photos courtesy Carnegie Branch Library for Local History, Boulder Historical Society Collection. BOULDER – Continuing the celebration of Boulder’s 150th birthday, Boulder residents, families and friends are invited to participate in a historic Sesquicentennial Stroll on July 4. Organized by the Boulder 150 Sesquicentennial Celebration Committee, the Stroll is a daylong series of celebratory events inviting people to stroll through the city, visiting many of Boulder’s historic landmarks. Maps will be available at all of the Stroll stops. The day kicks off at 11 a.m. with an official welcome ceremony in the historic Chautauqua auditorium and concludes with Boulder 150 tie-ins that evening at Boulder’s July 4 fireworks at Folsom Field – a city tradition since 1941. Parking at Chautauqua is very limited so participants are urged to park cars at the Twenty Ninth Street retail mall and use free HOP buses running every 15 minutes from there to Chautauqua, Baseline Road, between 9 a.m. and 3 p.m. Buses also return to Twenty Ninth Street after fireworks at Folsom Field. Bike riders are encouraged to participate. Food will be sold along the Stroll. The Chautauqua Dining Hall will be open for service with barbeque on its patio following auditorium program. Some Farmers’ Market vendors will remain open during the afternoon. The Millennium Harvest House is offering reservation-only July 4 barbeque, and the St. Julien Hotel is hosting a special July 4, 5-7 p.m. happy hour and live music from 7-9 p.m. on its outside terrace. Participants who complete the full Stroll route, with maps stamped at each stop, will receive a commemorative award in recognition of the Sesquicentennial (limit one per family). A full schedule of all Sesquicentennial events, as well as links to stories and interesting facts about Boulder’s history are online at www.boulder150.com. 11 a.m.-12:15 p.m. Welcome Ceremony presented by the Chautauqua Association. Rocky Mountain National Park Superintendent Vaughn Baker will present National Historic Landmark plaque. Welcome by U.S. Rep. Jared Polis. Special performances will celebrate the history of arts past and present in Boulder. 12:15-1:30 p.m. Colorado Music Festival Brass Band will perform under tent on the Green, barbeque available from Chautauqua Dining Hall. Event will be zero-waste, with Eco-Cycle assisting. Visit Sesquicentennial Quilt display in Chautauqua Dining Hall June through July. Quilt program, 7 p.m., Wednesday, July 1 in Community House. Columbia Cemetery, “Stroll with the Spirits” presented by Historic Boulder, Inc.
Boulder History Museum serves “Happy Birthday Boulder” cake and hosts the opening of “Only in Boulder” exhibit. Activities for children include gold panning and arts and crafts. CU Heritage Center presents “Boulder and CU Through the Years.” Since 1876 Boulder’s growth and development have been closely tied to that of the University of Colorado. Learn about CU’s colorful history. 2-5:30 p.m. Bluegrass Concert at Central Park Band Shell featuring Boulder Acoustic Society and Blue Canyon Boys. Some Farmers’ Market food vendors will remain open. Welcome by U.S. Sen. Michael Bennet. 2:30-3:30 p.m. 4th of July Children’s Bike Parade in Central Park organized by Parenting Place; come early to decorate. 2-5:30 p.m. Stroll “globally” and celebrate ties with Boulder’s Sister City communities in Africa, Asia and Central America at Municipal Building Plaza. Learn about projects and exchanges in this people-to-people program. 8-10 p.m. Ralphie’s Independence Day Blast at Folsom Field featuring a Boulder 150 birthday party. Following the July 4 celebration, the next major event for Boulder’s Sesquicentennial will be a “Coming Back Home” gathering, extending the city’s friendship with the Northern Arapaho tribe, Aug. 7-8, on the Pearl Street Mall. For more information on the Boulder Sesquicentennial and 150 banner sales, go to the Boulder 150 Web site at www.boulder150.com. Take this you North Boulder coffee snobs. We're about to get our own SoBO (south Boulder) Vic's, and ours will have a drive thru window. So there. I've been watching the new coffee shop go up at the former site of a MacDonald's on Table Mesa Drive and got a short walk-through today. The interior is especially sunny, with a modern design. 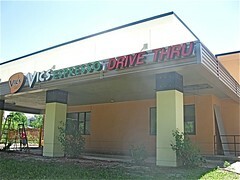 The drive-thru window will be operated separately from the rest of the shop, with its own separate espresso machine. A big plus here should be ample parking vs. the often-crowded parking lot at the Vic's on Broadway. And this site should get good traffic of commuters returning to Boulder, coming in off U.S. 36 and Highway 93. Vic's should be a welcome addition to the independent local coffee scene in South Boulder, where Cafe Sole is a favorite with the locals on this end of town. The new Vic's could be open very soon, with the finishing details (and a new phone line) going in this week. I'll try to keep you posted. Now you can own a piece of Boulder’s history, the PR & Marketing Committee of Boulder's 150th anniversary says. The Boulder Sesquicentennial Celebration Committee is selling the limited art Sesquicentennial banners presently hanging on Boulder’s Pearl Street Mall. The colorful banners, designed by local artist Steve Lowtwait, are being sold with first-come, first-served orders. Banners will be delivered to buyers “as is” as soon as they come down in early fall. Fewer than 100 of these original art banners are available, and your purchase is a tax-deductible donation used to fund citywide Boulder 150 events. There are also six different designs: Hotel Boulderado, Flatirons, Pearl Street Mall, CU Old Main, Chautauqua Auditorium and Historic Neighborhoods. To order your banner, please download an order form from the Boulder Sesquicentennial Web site at www.boulder150.com, or call Sesquicentennial Fundraising Chairman Bob Yates at 720-888-2283. Please give your choice of size and first, second and third choice of design. Also indicate if you are willing to purchase a different size if your first choice sells out. Mark Emery, left, executive director of Imagine!, and Bob and Judy Charles show architectural drawing of the new SmartHome, which will open in Boulder this summer. The home will be one of the first in the nation, and serve as a model for future of residential care for people with cognitive disabilities. I'm excited to help spread the word that Imagine!, a Lafayette, Colo.-based nonprofit providing care to people with cognitive and physical disabilities, has just launched a new "fan" page on Facebook, and is making more plans to expand its reach through social media. This summer Imagine! will complete and open its new Bob and July Charles SmartHome at 18th and Iris streets in Boulder. This home, and another to be built in Longmont, will be national models for how the latest technologies, as well as green building, can be used in a community home to assist the residents. The technologies will make the caregivers more effective, too, by allowing them to track medications, computerize reminders about client needs and monitor sensors for better awareness and accountability of residents. The SmartHome project will be exciting to watch, and much more information is available online from Imagine! including photos, videos and architectural drawings of the new homes. I serve on the Imagine! Foundation, which was started to raise money to help pay off the mortgages of several existing homes, and now we're in a new fund-raising capital campaign to complete the SmartHomes. You can make a secure online donation for the SmartHome campaign, or you could contact me personally for information about the campaign and how you could help. Imagine! will be putting out a lot more information and news as the SmartHomes project advances. I hope you'll follow the progress. Will screen staring be the demise of printed news? I’m an avid morning newspaper reader, a habit developed from years of working as an editor and that bred-in fear of being beat on a story. Knowing there are several newspapers in my driveway and how good that morning coffee is going to taste gets me out of bed early. Reading the headlines lately, I often think to myself: I already knew about that. These are stories I care about, but the news is already stale. The future of newspapers is now a national debate, but it’s being played out in everyone’s hometown newsroom. For example, the Camera reported this morning on tire slashings around the city, including my neighborhood. That’s news I need to know. But yesterday our neighborhood online discussion group lit up with everyone’s first-person reports of the vandalism. By the time the morning paper even went to print, meetings had been organized for a Neighborhood Watch group. That wasn’t mentioned in the story. I read about the demise of the Rocky Mountain News from a friend on Facebook, not the newspaper. Sports pages are really full of “old” news. Fans don’t wait, they read scores or even the game’s play by play online, often on their phone. As I’ve added more online social media, particularly Facebook, Twitter and Boulder-based companies’ tools, like Filtrbox and the Business Report’s Daily E-news, I expect breaking news to reach me all day, much of it customized to exactly what I want. Outing’s column, “Getting Money from Readers Who Won’t Pay for Online News,” not only disputes the latest pay-for-Web-content strategy announced by MediaNews Group of Denver, owner of both the Post and the Camera, but also lays out several reasonable alternative solutions. New ideas to save newspapers are plentiful. Here’s one of them. What would happen, do you think, if the front page of your morning paper had an appeal sounding very much like those frequent fund-raising drives that support public radio? It would read something like this: In order to keep bringing you the quality news reporting you’ve come to expect, we’re asking you to make a tax-deductible contribution every month and become a paid member of our new nonprofit newspaper. As newspapers lose subscribers to free online sites and blogs, lose (make that lost) classifieds to Craig’s List, and lose automobile, real estate and large national advertisers to the Internet, is the day of a philanthropic, nonprofit model so far fetched? Several working journalists (except for the two recently laid off) approached this topic at the CU World Affairs Conference. Investigative journalist Roberta Baskin, who broke stories on Nike’s sweatshops in Vietnam, described the “tsunami of change” sweeping the media industry, saying in many cases “It’s a race to the bottom right now.” Not only are investigative reporters being fired because of their higher expenses and salaries, but media executives fret much more about the costs of possible litigation. “People don’t have the visual desire to hold a newspaper anymore,” she said. Newsrooms are more fearful than ever. “Those of us in the trenches knew the suits were not really behind us,” Engel said. All is not lost just yet. Reporters, editors and publishers are a resourceful group. New ideas like mobile phone apps or charging for content on Kindle e-readers are being tried, and so-called “niche” publishers, including ethnic publications, are even growing. News that is “hyper local,” including more “citizen journalists” attending school board meetings, is finding some footing. You might try reading The Huffington Post, an Internet-only newspaper with blogs, videos, e-mail alerts, Twitters, and I just learned from The Economist, just four reporters in a staff of 60. The InDenver Times is being run by former Rocky staffers. IWantMyRocky.com is still online, but needs a new name. Yes, I’m staring more at computer screens these days. But I refuse to do it with my morning coffee.